Remember Annabelle, the tres creepy doll from The Conjuring? Well, she’s back and she’s starring in a film of her very own! Annabelle is the first horror film to be given a wide release this October and, judging from the commercials, New Line Cinema and Warner Bros. are really hoping that you’ll remember just how scary and effective The Conjuring was when it comes time to decide whether you want to see Annabelle or Gone Girlthis weekend. 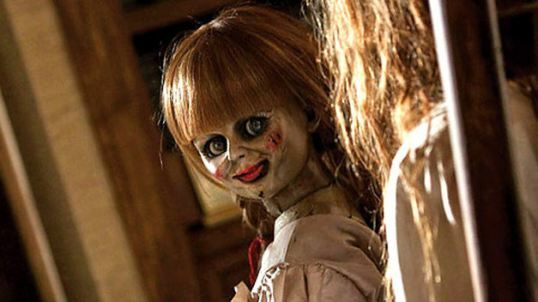 Of course, Annabelle actually have very little do with The Conjuring. Though Father Perez, the token concerned priest played by Tony Amendola, mentions Ed and Lorraine Warren, neither one of them actually appears in the film. Neither do any of the other characters or ghosts from The Conjuring. The only link between the two films is that doll. No, I’m not going to spoil it for you. In fact, it’s really not necessary for me to spoil it for you because I imagine you can probably guess everything that’s going to happen. If you’ve ever seen a haunted house film, you know exactly what’s going to happen when John goes to work and Mia gets left in the house alone. If you’ve ever seen a demonic possession film, you can guess what’s going to happen when Mia happens to stumble across the occult book store next door. And, if you’ve ever seen any film, you can guess that the book store is managed by a sassy mystic played by Alfre Woodard. That’s right! There’s nothing surprising about Annabelle! But that’s not necessarily a bad thing. Horror films are unique in that they often times actually benefit from being so predictable. You watch in dread because you know that something terrible is going to happen even though the characters in the film do not. You know enough to yell, “Don’t open that door!” but the characters in the film don’t. That’s exactly what makes a film like Annabelle scary. The Conjuring, I thought, was not only a great horror film but it was also one of the best films of 2013. That’s because, along with being a scary movie, The Conjuring also dealt quite intelligently with very real issues of faith and family. The Conjuring was fun to watch because it was scary but it stayed with you because it was full of subtext. Annabelle, on the other hand, is a film without subtext. Everything important about Annabelle can be found right on the surface. 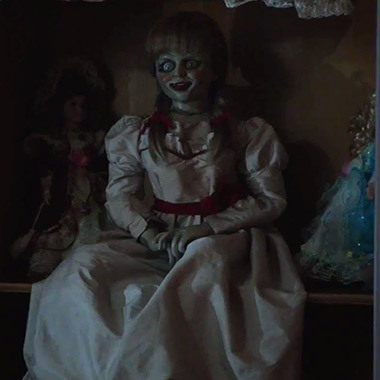 Annabelle is a film that exists solely to scare you and how much you enjoy it will probably depend on how much you enjoy horror films to begin with. The shock scenes are handled well, with an emphasis on sudden noise on the soundtrack and intimidating shadows appearing in the background. Everything that distinguished The Conjuring — the attention to detail, the lively performances, and the imaginative plotting — has been pushed to the side to make room for the next scare. As a result, Annabelle is one of those films that makes you jump while you’re watching it but doesn’t stick around in your head afterwards. If you’re a fan of the horror genre and like a good scare, you’ll probably find something to enjoy in Annabelle. (It’s no Devil’s Due but it’s still better than the latest Paranormal Activity film.) If you’re not a horror fan — well, then you probably weren’t planning on seeing Annabelle in the first place.